Almost 39 million people in North America have diabetes. If we do not act now, this figure will reach 50 million by 2035. 1 in 9 adults have diabetes in North America – the highest prevalence across regions. 27% of them have not been diagnosed and are at a higher risk of developing harmful and costly complications. In North America, diabetes will cause 297,000 deaths in 2014. 41% of those deaths will be in people under the age of 60. 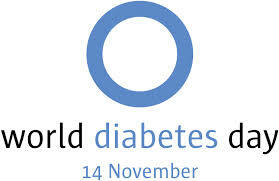 Worldwide, every 7 seconds one person dies from diabetes or complications of diabetes. Diabetes is the leading cause of blindness, kidney failure and amputation. Worldwide, $310 billion will be spent on treating diabetes. In November of 2008, less than two months shy of my 40th birthday, I was diagnosed with Type 1 diabetes. I have decided to re-share the account of my diagnosis today, as I have another related blog post planned for the 6th anniversary of my diagnosis. Despite the fact I had been around the theatre practically since birth, it wasn’t until 1979 that I first acted before an audience that wasn’t assembled in my living room. It was in a children’s play called Once Upon A Clothesline and I portrayed the pivotal role of Dr. Beetle who aids the unfortunate clothespin Pinette, who has fallen from the clothesline. We rehearsed at the YMCA in whichever room was available to accommodate our tween-aged thespian troupe. On one particular afternoon we rehearsed in the gym amidst the gymnastics equipment. Like most 10-year-old girls who had been swept up in the whirlwind of Nadia Comaneci’s 1976 Summer Olympics in Montreal, I took gymnastics. And having taken two years of gymnastics classes at that very same Y, I fancied myself a gymnast. One wintry afternoon, during my offstage time, I found myself wandering over to the balance beam and performing a round-off dismount that ended in a very un-Comanecilike landing. The next morning my swollen and purple foot prompted a visit to the doctor’s office. 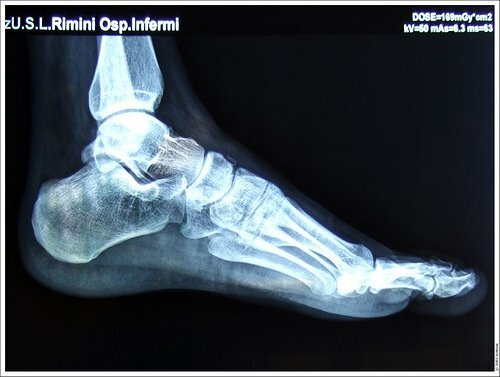 Upon further examination, the doctor suspected that the foot might be broken and put my foot in a temporary splint that would stabilize it until we got to the hospital to have it x-rayed. As he was wrapping my foot, I remember crying. Not because my foot hurt, although it did, but because I was going to miss out on my big acting debut. A broken growth plate, a foot cast and a set of crutches later, the accommodating creative team rallied and I was still able to make my acting debut. In fact, the doctor that made her entrance on crutches was cause for a bit of a chortle. So, despite the drama and the tears, the show still went on and I with it. Throughout the years, many of my acting experiences have had a “broken foot” that I’ve had to work through alongside the performance: my aunt’s suicide, the death of my grandfather, my sister’s near fatal accident, my father’s cancer diagnosis. In many ways, having a show to focus on has helped me work through those difficult times. It is probably one of the many reasons that I have such a passion for theatre and why I repeatedly refer to it as my one true constant. Nowadays, after having dallied in many of the theatre’s disciplines – acting, writing, directing, design, stage management, choreography and crew – I find myself opting for directing projects. Don’t get me wrong, I love acting but because I have to be more discretionary with how I select my theatre projects I usually opt for directing projects. In most cases I am more passionate about the shows that I have the opportunity to direct than the ones that I would be interested in auditioning for. Of course, as fate often dictates, when it rains it pours. 2009 promises to be quite the theatrical year for me. I have received four offers to direct, two of which I have accepted. Furthermore, while official announcements won’t be made until January, there are a few other theatre-related endeavors that I will have a hand in. Naturally, amidst this flurry of theatrical activity, two dream roles that I would give my eye-teeth to audition for have surfaced. Given my love for theatre, all of this opportunity is akin to letting a kid loose in a candy store. And being the realist that I am, I have been waiting for a few months for the other shoe to drop. The shoe first dropped with the reminder that I need to be cognizant of the other responsibilities that I have in my life: my family, my marriage, my job. Regretfully, I never pursued my theatrical ambitions in earnest and, therefore, my love of the stage does not pay the bills. As such, there is no justification for my theatrical adventures outside of the happiness and personal fulfillment it brings me. Given the strain that it puts on the other aspects of my life and recognizing the selfishness of pursuing an unrealized dream is basically a dropping shoe that was both inevitable and justified. However, unbeknownst to me at the time, that dropping shoe was falling off of a broken foot. Last week I was diagnosed with Type 1 diabetes. During tech week for Little Women and the week abroad that followed I was feeling a bit under the weather. I knew something was up and scheduled a doctor’s appointment for the Monday following my return from the UK. At the appointment I listed off my symptoms and the nurse asked me if I had history of diabetes in my family. After a couple of quick tests in the office, it was evident that I did, in fact, have diabetes. My doctor sent me to the pharmacy and I was put on insulin straight away. The next day, I went to the endocrinologist who explained to me that I had such high sugar and ketone levels that I narrowly escaped ketoacidosis and hospitalization. Another blood test later, it was revealed that I did indeed have type 1 diabetes and that I would be on insulin injections for the rest of my life. 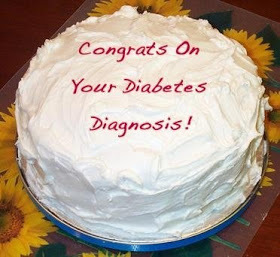 Now, like any self-respecting theatre aficionado, I have seen Steel Magnolias and, until now, that play/film had formed the basis for my knowledge of diabetes, specifically type 1 which Julia Roberts’ character Shelby has. When I tell people of my diagnosis, I can see in their faces whether or not they are replaying select scenes Steel Magnolias in their heads. And that’s okay. I have done it countless times, too. There are times when I’m scared. There are times when I’m pissed off. There are times when I’m sad. There are times when I’m defiant. And those feelings will not go away, much like the disease responsible for generating them. I’m sure these emotions will grow more infrequent as I prepare for a lifetime of “managing” diabetes. It is just a matter of incorporating them, and it, into my now drastically altered life. It is amazing what a person can learn in two weeks. Naturally, I am reading as much as I can about the disease and am doing my level best to get it under control. My life experiences have provided a pretty solid medical knowledge, so I’m learning the textbook side of things fairly easily and I’ve become a pro at injecting insulin into my now bruise-covered stomach. But in the past two weeks I’ve also learned a lot about myself. I’ve learned that I have a passion for many things: my family, my friends and my art. I’ve also learned how difficult it is to balance so many loves. While it isn’t a skill I’ve yet mastered, it is one I plan to hone. But as Emerson says, art is a jealous mistress. Believe me, I recognize the priorities I’ve got at the moment but I also know that my mistress will wait only so long before she gets restless. So here I am, left to steady my course and face the road ahead. Yes, I have a broken foot and, while it may slow me down for a bit, it will not stop me. So, despite the drama and the tears, the show will go on and I will go on with it.